Established as a Business Hotel, catering to mid-segment and upper mid-segment/business executives, Hotel Paradise opens up exciting new vistas for a business traveller/tourist alike, where scooting ambience, divine cosine and exceptional service is our tradition. A tradition in gracious hospitality that is recommended by all the leading travel portals worldwide. 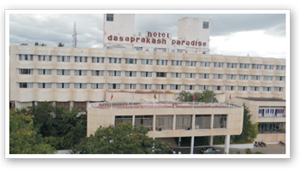 Hotel Paradise presents a unique proposition to a business traveller / tourist, by being equidistant to all major tourist attractions in and around mysore city, yet being away from the normal hustle and bustle.